Designed to help children brush teeth longer and better - appropriate for children aged 3 years +. Rotating brush head has a raised center row to clean chewing surfaces where cavities tend to form. Ergonomic handle designed for children?s small hands. Power Battery toothbrush. 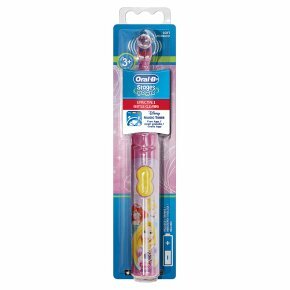 The Oral B Stages Power Battery toothbrush is designed especially for children. With fun, colourful designs and soft bristles, the toothbrush is a fun way for kids to learn.